The men of Goole whose calling was the sea bore a heavy burden throughout the years of 1914-18. Not only did they have to brave the sea’s torment as a result of nature, they also had to overcome the very real threat of facing an enemy that was more deadly, and at times unseen. The submarine, used by Germany in an attempt to curb British shipping movements – both militarily and mercantile, was seen by some high-ranking officers of the Royal Navy as the use of underhand tactics; but the nature and conduct of warfare was changing and the seamen of Goole and other ports were going to be in the ‘front-line’. Its effect on Goole was to be seen first-hand on a number of occasions, but the first was time was not just a local loss but a national one. 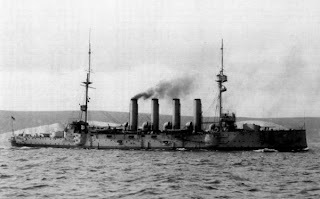 On the morning of 22nd September, 1914, His Majesty’s Ships Cressy, Hogue and Aboukir, forming 7th Cruiser Squadron were in the North Sea, steaming at about 10 knots approximately 30 miles south-west of Ijmuiden, when at about 0630 Aboukir suffered an explosion to her starboard side. The first belief was that the ship had struck a mine and her Captain, J.D. Drummond, signalled her two consorts to come alongside to assist. 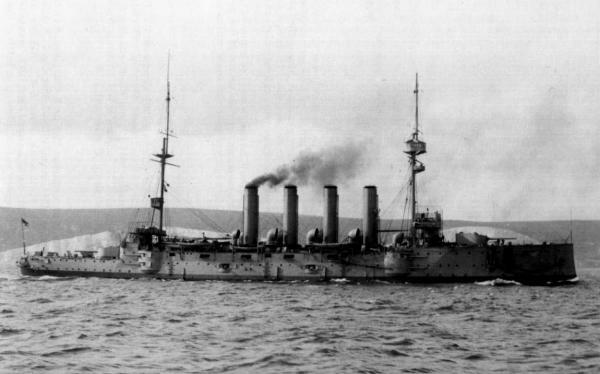 Only one cutter was launched before power was lost, and despite counter-flooding to reduce the twenty-five degree list, Aboukir heeled over about 25 minutes after the explosion. Due to the initial assumption as to the cause of her loss, both remaining ships steered close to the survivors to aid their efforts in taking them aboard. The Captain of HMS Hogue, W.S. Nicholson, though, was starting to believe that a submarine was in the area and ordered a sharp look-out to be kept for periscopes. Despite this, and after starting to manoeuvre away once her boats were lowered, Hogue was struck twice in quick succession by two torpedoes to her port side, and at the exact same time a U-boat was seen to surface off her port quarter. Fire was immediately opened on the enemy vessel, but no hits were registered as she quickly submerged. After settling due to the inrush of water, which quickly flooded the quarterdeck, some ten minutes after being struck the Hogue steadily rolled over and sank. The Captain of the Cressy, R.W. Johnson, despite the obvious threat posed by the enemy, steamed slowly about the wreck site of the Aboukir, and was ultimately, surrounded by boats, flotsam and men of both ships. At 0717 two torpedo tracks were sighted, and even though she presented an easy target, one passed to the stern while the other struck amidships on the starboard side. Gunners fired their weapons at what was assumed to be the submarine’s conning tower, when a third torpedo struck on the port beam. The Cressy started to flood quickly, and unlike her sister ships, rolled over on to her back for a few moments before disappearing from view. The loss of three ships totalling 36,000 tons in less than an hour was a severe blow to the Royal Navy, and senior officers were left dumbfounded that a ‘toy’ could do such deeds. Each of these armoured cruisers had a complement of about 700 officers and men; 1,397 officers and men were lost, the 60 officers and 777 ratings who survived were rescued by the Dutch merchant ships Flora and Titan, and also two trawlers. Seamen Ernest Clark, Royal Naval Reserve, was 22 years old when he was ‘called up’ two days prior to War being declared on Monday 4th August. He joined his ship at Chatham on the following Thursday. Prior to then he was an AB/Cook aboard the ‘Lanky’ boat Spen, and his home was in Phoenix Yard, Bridge Street, where he lived with his wife, Annie; after his death she moved to her parent’s, in Bridge Street. The fate of Ernest was not readily ascertained as his name did not appear on the list of known casualties, and it was only in response to a letter from Annie that the Admiralty confirmed he was not among the survivors. The commander of the submarine U-9, Otto Weddigen, was lauded as a hero for his actions on this day, being awarded the Iron Cross First Class. The contrast against the captains of the ships he sank couldn’t be more severe; all were criticised for their actions, both before and after the first torpedo hit HMS Aboukir, though the Admiralty recognised that Captain Johnson was placed ‘in a cruel position…in waters swarming with drowning men’. Captain Johnson was the only commander of the three ships to lose his life. Is it 1918 or 1919, or even 2010? The 'Lanky', the 'Great War' and Goole. Goole and the First World War introduction.